September’s official birthstone, the blue sapphire, is one of the most beautiful and regal of all gemstones. Improve your knowledge of sapphires with this issue’s Adina by Empire’s newsletter, then check out our online eBay store and find yourself the perfect piece of sapphire jewelry! Blue sapphire is a variety of the mineral corundum, the same mineral that rubies come from. The sapphire is derived from the Greek word sapphirus, which means blue. On the Mohs hardness scale, sapphires are second only to diamonds in hardness. Although sapphires come in many colors, the most valuable and sought after are deep blue sapphires. In addition to the birthstone for September, sapphires are also the gemstone for 45th wedding anniversaries. The ancient Greeks believed sapphires were a symbol of wisdom and purity. The ancient Persians believed the Earth was supported by a giant sapphire and its reflection made the sky blue. According to Jewish midrash, Moses was given tablets of sapphire that were carved from God’s throne, making them the most precious gemstone. The late Diana, Princess of Wales, famously chose a blue sapphire and diamond ring for her engagement to Prince Charles. After enheriting it upon her death, Prince William gave his mother’s ring to Kate Middleton when he proposed to her, and she now wears it. 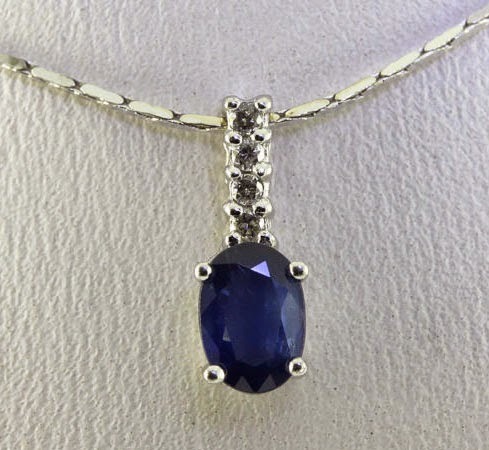 If you’re looking to buy beautiful sapphire jewelry, either for yourself or a loved one born in September, Adina by Empire Jewelers has a magnificent collection of estate and vintage sapphire jewelry, available at true wholesale prices. Shop online today, and remember, if you have any questions, please don’t hesitate to contact us.